Buy Tofurky Hickory Smoked Style Slices in the UK from our online shop or directly from our independent Scottish store. These meat substitute slices are smoked in a real smokehouse over hickory chips to give a sweet, smoky flavour and beautiful brown crust on the outside. To impart a delicate smoke flavour to these deli slices, we smoke our famous Tofurky recipe in a real smokehouse over hickory chips to give a sweet, smoky flavour and beautiful brown crust on the outside. It would be easier to just add liquid smoke to the recipe, like our competitors, but we feel that the flavour is more authentic with natural smoke. Perfect for picnics, lunches or straight out of the pack. Water, vital wheat gluten, organic tofu (water, organic soybeans, magnesium chloride, calcium chloride), shoyu soy sauce (water, non-gmo soybeans, wheat, salt, culture) non-gmo expeller pressed canola oil, vegan natural flavours, non-gmo corn starch, white bean flour, garbanzo bean flour, lemon juice from concentrate, onion, celery, calcium lactate from beets, sea salt. We sell real Tofurky and other Meat Replacements directly from our shop in Scotland and online throughout the UK. View more products from Tofurky. Where can you buy real Tofurky Hickory Smoked Style Slices safely online? If you are wondering where you can buy Tofurky Hickory Smoked Style Slices safely online in the UK, then shop with us. We are an actual health foods shop; with real people selling real foods and products. Our award-winning independent shop is located in Stirling, Scotland since 1976. You can buy our Meat Replacements in store or safely place an order with us online or over the phone. 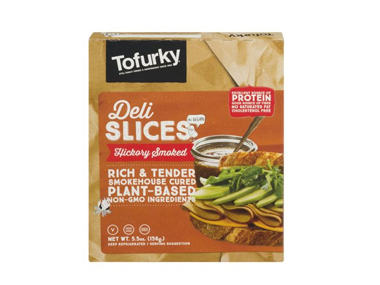 Tofurky Hickory Smoked Style Slices - Tofurky Hickory Smoked Style Slices in Meat Replacements and Chilled Foods.